One A4 Quick Reference Sheet is sufficient to contain all the information necessary to play Hordes & Heroes Medieval. The main rules need only be consulted when players are learning the rules, and occasionally thereafter, to clarify situations as they arise. 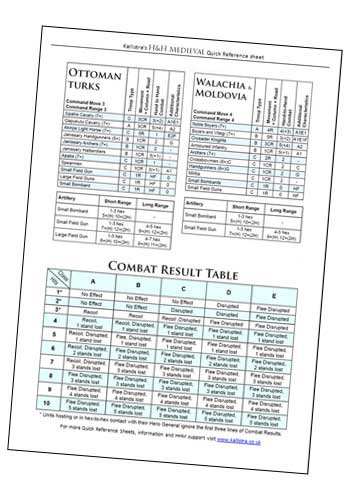 The Quick Reference Sheet Generator allows you to produce a Quick Reference Sheet (QRS) for your two select armies and print all the nessessary information including the Combat Results Table on one sheet of paper. The pdf produced is A4 size, however, it can be printed any size by selecting the size option on the printer dialogue box. Please take a moment to login to use this generator. The HHM army lists are designed to enable any medieval historical army to be represented on the table top, in a miniature game, up to an agreed point value. We have endeavoured to make the lists as flexible as the historical sources which were consulted would permit. Hordes & Heroes Medieval Army Lists currently contain 28 different armies which can be easily modified and adapted to your own specific preferences or requirements, for use in a particular game, or to form part of an historical campaign. The HHM Army lists are also available FREE to download.